Two years after season seven ended with the biggest cliffhanger of all times - that Jon Snow is a Targaryen and the true heir to the Iron Throne - the audience begin their journey with their favourite characters to the end of the show. Yes, Jon Snow finally learns about his true identity as Bran and Samwell Tarly decide that Jon should know he's actually the son of Lyanna Stark and Rhaegar Targaryen (Daenerys' brother) and the grandson of Aerys II Targaryen aka the Mad King. Jon, who bent the knee before Daenerys Targaryen long ago, insists that she be the queen of the Seven Kingdoms. Jon and Daenerys arrive in Winterfell with the full might of her army, including the Unsullied, the Dothraki and the two dragons. Despite Daenerys Targaryen's impressive entry to Winterfell, the northerners are unwilling to put their faith in the 'Targaryen Queen.' Sansa too disapproves of Jon renouncing the title of 'King in the North.' 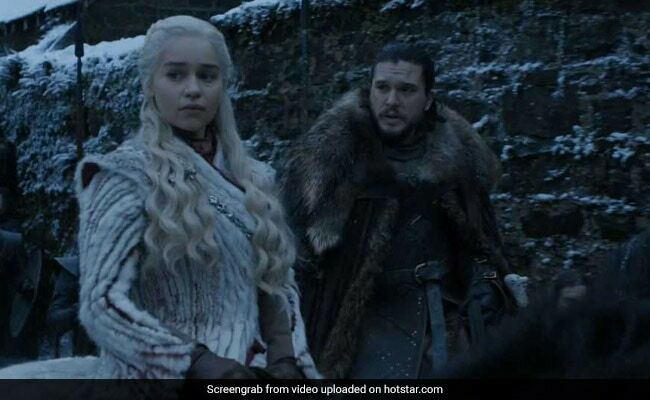 To make matters worse, the Starks lose some of their allies, who swore to back Jon Snow but cannot now as he has sworn his allegiance to Daenerys Targaryen. Meanwhile, Rhaegal, one of Daenerys' dragon, lets Jon Snow mount him while she herself rides Drogon. The dragons putting their faith in Jon Snow also reiterates Jon's Targaryen lineage. In one part of the episode, Bran tells Jon and Daenerys that her slain dragon Viserion has been resurrected by the Night King. At the King's Landing, Cersei Lannister tasks Ser Bronn with putting an end to her 'treacherous brother' Jaime Lannister while she takes her relationship with Euron Greyjoy to the next level. Euron Greyjoy works hard to impress Cersei and manages to bring to her the Golden Army. In one segment of the episode, Theon successfully rescues his sister Yara from Euron's captivity and they flee King's Landing together with three ships. Theon, who now wants to do right by the Starks, part ways with his sister to join Jon Snow in Winterfell. Yara decides to reclaim the Iron Islands, the only place where the Army of the Dead cannot invade. The Night King sends a message to Winterfell and Jaime arrives in Winterfell to fight alongside Jon Snow and Daenerys Targaryen. There he comes face-to-face with Bran, who is paralysed waist-down because of a fall induced by Jaime when he was just a boy.